Ask fellow campers about "Tims Ford State Park" and nearby attractions. Campers should be aware that campsites on the inside of the loop have connections on the wrong side of the pad. Also longer units are advised to use the outside where they can hang off the end a little if needed. Sewer hookups sites 1-4. WiFi is working but slow. Verizon is spotty. We camped at Tims Ford State Park in a Travel Trailer. Great hiking trails around the park. Lot's of paved trails that are easy for strollers or small kids on bikes. 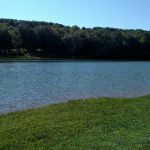 This is a nice state park right on the lake with lots of paved and unpaved hiking trails as well as a nice golf course. They had WiFi equipment installed, but it wasn't turned on yet as of Aug 2018. Verizon signal in the campground was spotty, but on the golf course it was fine. TRAILERS OVER 25' - chose the outside of the loop. All of the sites are very short, but on the outer sites the ground drops away so you can back up to the curb and let your trailer hang over. On the inner sites the ground slopes up, so you will very likely bottom out if you try to back in too far. We camped at Tims Ford State Park in a Travel Trailer. The golf course is great. Jack Daniel's is just a few min away in Lynchburg. This park is wonderfully maintained, and is very scenic. We would definitely go there again if in the area. 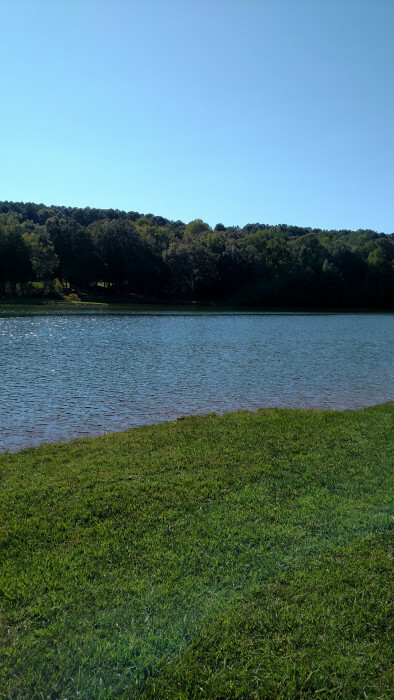 We camped at Tims Ford State Park in a Fifth Wheel. Being in a State Park, I was really surprised at how run-down this campground was. The bath-houses need to be torn down and new ones built. The campsites are poorly maintained. Run-off from the street drains right through the middle of the campsites. (Not just one, but many of them.) There is a certain level of quality that you expect from a state park. I am really embarassed for this one. We camped at Tims Ford State Park in a Travel Trailer. We stayed in on the "off season" in March so we had the park to ourselves and LOVED IT. We were in the woods and it was peaceful and enjoyable. Sites 1-4 are the only ones with full hook-up and site #1 that we had was really the only one really long enough for our 34ft. 5th wheel. There was plenty of room for our truck to park too. No real laundry on site. Verizon cell service was good but tough to get satellite through the trees. The park is putting in WiFi but it was not available while we were there. We camped at Tims Ford State Park in a Fifth Wheel. This is a very nice campground. Good access to good trails and the lake. We were able to grab about 30 TV channels over airways, so good for football Saturday. We camped at Tims Ford State Park in a Travel Trailer. For campers who want a lot of people close by, have a large friend/family group, this is a great park. For more solitude and quiet, is not the best park for a weekend. During the week is much slower, less people. The locals come here it seems, use the lake for boating and swimming, in the coves around the Fairview campground. Is a clean park, maybe needed more timely mowing of taller grass. We camped at Tims Ford State Park in a Motorhome. Restaurants: Skips, Scalawags, JTs BBQ in Winchester. Fiesta Grill in Cowan, all very good. I don't know what has happened to this state park. This was once our favorite destination but not any more. While most of the rangers and staff are friendly there is one who seems determined to spoil the camping trip if he can. He frequently patrols the campground looking for the tiniest infraction on the rules and gives folks a hard time. For example, I saw him go after a handicapped person because the front wheels of their truck was off the pavement, on gravel but off the pavement. Other TN state parks we've stayed at don't act this way, just Tims Ford. The picnic tables are shaky, the restrooms are nasty, and the wooden bridge over the lake inlet is in disrepair, all while he patrols looking for us lawbreakers. It's easy to see this once was a beautiful park but people like him can turn a pleasant outing into an unpleasant one. It'll be a while before we go back there and hopefully he will have a change in attitude or be working elsewhere by then. We camped at Tims Ford State Park in a Motorhome. It states as big rig accessible but any rig over 35 feet will have a hard time finding a spot to fit except in a very few places. It is not that close to see Jack Daniels or any of the other sites close to it because it is going to take a while to get from A-Z. It is a beautiful park if you just want to go and spend a few days to relax. There is not WiFi or cell We camped at Tims Ford State Park in a Motorhome. Great park for hiking and geocaching. Hiked 9.5 miles in one day on the trails here. Paved trails are also great for biking. We managed to get our 36' RV in and out OK, but there are several low hanging limbs we had to dodge along the way. Water pressure was great and had no problems with power. Unfortunately there are only a few sites that are suitable for a RV our size. Stayed in site #1 and had to use blocks under the front wheels to level the rig. Verizon voice and data worked fine. Staff was friendly and helpful at check in. We would have stayed longer if our schedule had allowed it and would stay here again. We camped at Tims Ford State Park in a Motorhome. This is a lovely park although it is quite isolated. There are four sites with full hookup and the price reflects the additional $5 per night for the sewer. There is a dump station on the way out so for short stays I wouldn't select the full hookup again. The rangers were patrolling the park the whole time even though there were only about four RVs in there at this time of the year. Beautiful walks and very well maintained with paths and roads being swept of leaves each couple of days. Easy (and pretty) drive to Lynchburg and the Jack Daniel's Distillery. We would definitely stay here again. We camped at Tims Ford State Park in a Fifth Wheel. This state park is simply beautiful! It has miles of biking and hiking trails and an abundance of wildlife. Deer and squirrels are everywhere! There is a huge swimming pool that is open during the summer and it looks well maintained. The campground is a little old and could use some sprucing up, but it's still pretty nice and the view of the lake is great. We are not bothered by the sounds of the kids having a good time riding their bicycles and so forth and have never had any problems with noise after dark. Some of the spaces are a little tight backing into, but we haven't had any problems so far. The staff has always been very friendly and helpful too. We've been here several times and keep coming back. It's a great spot for a weekend getaway. We camped at Tims Ford State Park in a Travel Trailer. Except for the first few sites (maybe sites 1-10) the sites are very short. Parking our 26 foot 5th wheel was a chore, so much so that hard cornering and running up on a two foot mount caused my camper to get into the roof and rear window of my truck ($1100.00 damage). Sites are not level (required two inch block on one side to level). Campgrounds not very well kept. Picnic table on different level from camper. But if you like children screaming from 8am-9pm this is the campground for you. There was the saving grace of going to Lynchburg to see the Jack Daniel's Distillery and have lunch at Miss BoBo's (oh, you have to do Miss BoBo's) and downtown Lynchburg is a hoot. Wife like the place OK, so I guess if she clubs me over the head I may be back. We camped at Tims Ford State Park in a Fifth Wheel. Are you affiliated with Tims Ford State Park ?